1926 Harry B. Read sold KQP to Northwestern Trust Co. for $2,400. (Jay Stockman, Secretary-Treasure). 1928 KEX 1250 kilocycles, moved to 1080 K.C., with 2,500 watts. 1928 KWJJ 1310 kilocycles, moved to 1200 K.C., with 50 watts. 1928 KFJR 1060 kilocycles moved to 1250 K.C., with 100 watts. 1928 KTBR 1060 kilocycles, moved to 1310 K.C., with 50 watts. Share time with KFIF. 1928 KXL 1360 kilocycles, increased power from 50 watts to 100 watts. 1928 KFIF 1400 kilocycles, moved to 1310 K.C., with 50 watts. Share time with KTBR. 1928 KFEC 1400 kilocycles, gained full occupancy of the frequency, with 50 watts. 1946 Harold “Day” Foster died at age 38 in Portland. KGW-KEX War Program Manager, 1943-44. KORE Program Director. 1950 KMCM affiliated with LBS-The Liberty Broadcasting System. Network owner: Gordon B. McLendon, KLIF. 1959 KLIQ, Inc. was sold to KLIQ Broadcasters for $90,000 (Stan Breyer, President & John Malloy, Vice-President). 1965 KWJJ switched to a Country format. First song played “I’ve Got A Tiger By The Tail” by Buck Owens. 1965 KKEY 1150 K.C., Vancouver became a Portland area secondary affiliate of the ABC Radio Network. 1979 Communico Northwest Corp. sold KMJK to Harte-Hanks Communications, Inc. for $1.3 Million. 1980 KBPS “D.J.’s Play Their Favorites” Craig Walker, Tom Michaels, Nick Diamond and Danny Wright. 1993 KGW call letters became KINK 20 days before KGW call letters had their 71st anniversary as Oreg.’s oldest. 1993 KINK 101.9 MHz., became KINK-FM continuing to simulcast its signature sound on its AM sister station. 1997 Western Broadcasting Co. (KKEY) was sold to J.J. McKay for $345,000. Transmitter site not included. 1998 Sinclair Broadcast Group sold KKSN AM/FM & KKRH to Entertainment Communication for $126.5 Million. 2007 Lance Mushaw died at 71 in Hillsboro. KUIK President & General Manager, 1970-73; News Director, 1960-70. Communico actually sold 106.7 to Southern Broadcasting which was absorbed by Harte Hankes. I went to work there in 1982, initially for Harte Hankes, but the FCC paperwork trail was in the name of Southern Broadcasting in the public file. Southern had a handful of stations and the whole enchilada became part of H – H. Southern was led by James Hoak. Hoak eventually moved on from H – H but was the v.p. and director of engineering across all of H – H when I got hired. I think he is the same James Hoak that’s now a cable zillionaire. They (H – H) sold it in ’83 to Vic Ives and his group. I worked with Hoak to get the first 107.1 translator up for KMJK to cover the shadow in Beaverton as they were on Mt. Scott at the time. Getting the translator up and licensed was a contingency for the sale to Vic. Edit add: History cards verify the sequence laid out in above post. Click for readable version. Andy: Have corrected and thank you for the research. 1934 KGW’s program “Homicide Squad” moved to sister station KEX on Friday’s from 9:30 P.M. to 10:00 P.M.
1946 KGW’s “Stars of Tomorrow” benefit for “American Red Cross.” Talent from Portland Public Schools. 1948 Annabeth Jamieson was born in Dallas, Texas. KBOO host of “Eve’s Organic Garden” 1977-87. 1960 KOHI Saint Helens, signed on air on 1600 K.C., with 1 K.W. daytime. Studios on Columbia River Highway. 1998 Joe Smidl died at age 93 in Troutdale. KEX Engineer, 1963-68. KWJJ Announcer, 1933-46. 1894 Fred White was born in Portland. KEX script writer for “Covered Wagon Days” program, 1935. 1931 KGW broke ground on its new transmitter and tower site in Faloma, just off North Denver Ave.
1947 Danny Lee aka (Dan Cochran) was born in McMinnville. KMCM Air Personality. KGAY, KECH. 1961 KPAM & KPFM mailed out their first subscription program guide listing broadcasts during March. 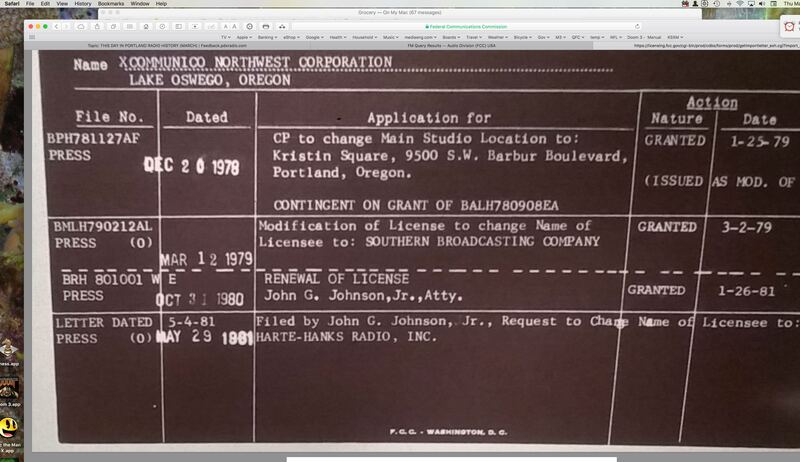 1972 KVAN FCC hearing began on the application of Cathryn Cragen Murphy for 1480 kHz., license KVAN. 1987 Danny Kaye died at age 74 in Los Angeles, CA. KXL AM/FM Co-owner, 1957-81. KJR, KJRB, KISW. 1987 Elinore Lee died at age 70 in West Linn. KRWC Forest Grove, Production Manager, 1956-57. 1994 Frank Kinkaid died at age 71 in Gainesville, Florida KXL newscaster, 1979. KOIN-FM host, 1975-76. 2001 KVAN 1550 kHz., increased day power to 23 K.W. Received interference complaints, then back to 10 K.W. 1922 7XG 360 meters (832.7 kilocycles) became Oregon’s first station to broadcast on a regular schedule. 1923 KGW 400 meters (749.2 kilocycles) reported heard in Georgia for the first time. 38th State logged by KGW. 1932 KGW debuted “The Society Column of The Air” at 10:15 A.M. hosted by Helene Jordan. Giving local bits of gossip. 2007 Mary Marsh died in Las Vegas, NV. KXL voice of daily prepared horoscopes, 1970-82 and Voice talent. 2011 Emmett Bernards died at age 85 in Portland. KGW Studio Engineer, in the mid 1940’s to mid 1970’s. KINK. 1912 Gerald J. “Jerry” Flesey was born in Jersey City, N.J. KISN General Manager, 1960-61. KOIL Sales Manager. 1928 KGW debuted “Dinner Concert” Monday’s at 6:00 P.M. featuring the Oil-O-Matic Orch. Williams Oil sponsor. 1934 KEX “Wrestling Bouts” Herb Owen presented Bulldog Jackson vs Tinkit Achiu, 9:45 P.M. to 10:30 P.M.
1962 KPOJ debuted one of Portland’s first weeknight talk shows “Niteline with Fenwick” 7:00 P.M. to 1:00 A.M.
1979 Jaime Cooley was born in Portland? KNRK Asst. Program Director & Music Director, 2003-08. 1990 Jack W. Adkins died at age 81 in Clackamas. KPDQ Chief Engineer, 1951-52 & Farm Director, 1952-53. 1998 S.W. McCready died at age 91 in Eugene. KVAN Co-General Manager & Chief Engineer, 1944-45. 2007 Donald J. “Don” Lane died at age 68 in Portland. KRDR Program Director, 1968-69 & News Director, 1965-68. 2007 Bill “Dr. Jazz” Fetsch died at age 79 in Portland. KMHD weekend morning Air Personality for 10 years. 2012 Jeff Davis died at age 58 in Newberg. KPDQ AM/FM, KFIS Production Manager, 1994-2012. KWJJ Program Director. 1910 Joseph E. “Joe” Patterson was born in Portland. KEX Technical Chief, 1954. Later KATU Engineer. 1916 Rev. Kenneth M. Haystead was born in Calif. KPDQ AM/FM “Peace For Today” host, 1963-65. 1922 7XF 360 meters, began broadcasting “Engineering and Industrial News” Monday nights 7:30 P.M.
1925 Bryce R. Howard was born in Portland. KHFS/KKEY Chief Engineer, 1955-66 & “KEY” Air Personality. 1932 KTBR 1300 K.C., dedicated new remote studio at Foursquare Church (1302 E. Ankeny St.) at 3:00 P.M.
1933 KGW-Oregonian-Pathe newsreel of Franklin D. Roosevelt’s inauguration viewed at RKO Orpheum Theater. 1959 Lars Larson was born in Taipei, Taiwan. KXL & Syndicated Talk Host. KEX, KGW, KJRB & KPTV. 1993 Jack Hamilton died at 67 in Portland. KWJJ Announcer, 1952-54. KXXL Program Director, KIDD Sales Manager, KOCN Sales Manager. 2009 Ted Rogers died at age 75 in Beaverton. KPDQ AM/FM Operations Manager, 1988-93. KYTE 1984-87. 1908 Fourth Portland public demonstration of wireless telegraph took place at the East Side Library. 1909 Jess Mason was born in North English, IA. KGW Commentator, 1951-56, KEX, KWJJ, KGON. 1931 KXL 1420 K.C., presented a “DX Program” Sunday morning 1:30 A.M. to 7:00 A.M. for distant listeners. 1939 Florinda J. “Linda” Weagant was born in Eugene. KKEY Owner, 1987-97 & Co-Owner, 1964-87. 1985 (Anola) “Peter” Mudie died at age 90 in Portland. She hosted KOIN’s “Consumer News” 1934-61. 1986 KSKD Contemporary Hit Radio “Cascade 105” switched to KXYQ standing for Q105 Means Music & Money. 1923 KFEC, Meier & Frank station presented a concert 9:00 P.M. to 10:00 P.M. Mignon Hawkes, violinist and others. 1971 KPAM-FM carried a recreation of the Frazier-Ali Fight with Jimmy Bang-Bang Walker, announcer, causing a MBS Network injunction. 1975 Paul LaRiviere died at age 64 in Eugene. KOAP-FM/TV General Manager, 1963-64. KEX-FM Program Director, 1960. 1928 Peter Marland-Jones was born in Lancashire, England. KKEY Talk Show Host, 1975-77 & 1972-73. KEX. 1929 KXL 1250 kilocycles, began 24 hour operation. Purportedly Northwest’s only 24 hour station at the time. 1942 Mark Lindsay was born in Eugene. KLTH “K-Hits” Air Personality, 2006-08. KKSN “Kisn 910”, 2006. 1950 KWJJ-FM announced it wouldn’t go dark yet. The Portland Beavers had signed a broadcast contract. 1959 Heidi Tauber was born in Libby, Montana. KKSN-FM News Director, 1991-93. KOPB-FM, KPOJ, KINK. 1985 Bob Thomlinson died at age 77 in Fort Lewis, Wash. KGW-KEX Chief Announcer, 1930-41. KGW. 1920 Thomas J. “Tom” Swafford was born in Lebanon. KALE/KPOJ Program Director, 1947-50. KGW. 1921 Robert Ellis “Bob” Rudolph was born in Portland. KEX Sales Manager, 1954-62 & 1945. KGW. 1931 KGW debuted the popular drama “Covered Wagon Days” Tuesday’s at 9:30 P.M. Lasted nine years. 1980 KXL 750 kHz., affiliated with MBS the “Mutual Broadcasting System” on their hour news feed. 1983 KGW 620 kHz., became the first AM station in Portland to broadcast in Stereo (Motorola C-QUAM). 1926 Harry Read, former KQP owner announced “he had been swindled by Jay Stockman” KQP owner. 1950 KGON 1230 K.C., Oregon City, affiliated with “Liberty Broadcasting System.” LBS headquartered at KLIF Dallas, TX. 1981 KARO was turned down by Multnomah County to build four, 172 foot towers on Government Island. 1991 Lee B. Wailes died at age 85 in Plantation, Fla. KEX President, 1944-45 (Westinghouse Radio). 1999 Howard S. “Jake” Jacobson died at age 98 in Clackamas. KXL President, 1947-55 & General Manager, 1943-55. 1921 7ZI broadcast phonograph music for Northwestern Radio Club’s dance at Glencoe School, 1/2 mile away. 1924 KFFO 229 meters (1309.1 kilocycles) Hillsboro signed off the air by owner Dr. E.H. Smith, Osteopath. 1934 Rodney “Rod” Woita was born in Wahoo, Neb. KRWC Forest Grove, Sports Director, 1955-56. 1935 KOIN debuted “Northwestern Neighbors” program at 9:00 P.M. Sponsored by Northwestern Electric. 1945 KWJJ began the public service program “For Home & School” hosted by Vere Kneeland at 3:00 P.M.
2004 Beaverton pirate station “Energy 98” was fined $10,000 by the FCC to stop broadcasting on 98.1 MHz.